A FATHER has paid tribute to his “beautiful, innocent” baby girl who died tragically at the hands of her depressed mother, as calls grow for mental health services to be overhauled in the wake of the case. A Victim Support statement delivered on behalf of nine-month-old Chloe’s father, Craig Steedman, told of the heartache he had endured following the death. Chloe’s mother, Erin Sutherland, was yesterday sentenced to three years for killing her baby daughter while suffering from postnatal depression, unable to access specialist care. She will serve the sentence in a psychiatric hospital until she is deemed fit enough for prison. Mr Steedman and his family are upset and saddened that the focus of reports in this case turned to how the system had failed Erin Sutherland and not the death of his “precious little girl”, the statement said. “Chloe was the victim in this case – a beautiful, innocent child whose tragic, senseless death is impossible to accept. The case has heightened calls for mental health services for new mums to be extended beyond a six-month cut-off, currently in place under NHS Lothian care. Sutherland, 36, had tried to access help in December last year, when her family doctor contacted a perinatal mental health team for her to see a community psychiatric nurse. However, following a consultation, support could not be offered because of the child’s age. The High Court in Edinburgh heard postnatal depression was no longer considered a factor after the child was more than six months old. Judge Lady Wise said it was regrettable that the support Sutherland needed for her depression was not made available but she acted in a way society finds abhorrent. Sutherland smothered her daughter, aged almost ten months, at their Sighthill home in February. The mother was later found unconscious after overdosing on prescription medication. She was originally charged with murder but pleaded guilty to culpable homicide on the grounds of diminished responsibility. Judge Lady Wise said Sutherland would only go to jail once she had completed hospital treatment. In the aftermath of the case, the Scottish Government has asked the Mental Health Welfare Commission to carry out an inquiry. Defence counsel Gordon Jackson QC told the court yesterday the circumstances were “extremely tragic” and Sutherland had intended to take her own life. 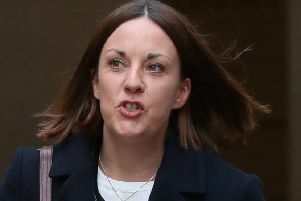 Sutherland had previously been diagnosed with post-natal depression following the birth of another baby when that child was eight months old and became an inpatient in 2006. This earlier episode of PND saw Sutherland believing it would be better for her two children if she died and took them with her. The case has focused attention on the specialist psychiatry service which is said to be facing an uncertain future due to a “fragile” staffing situation. Dr David Farquharson, NHS Lothian medical director, told a board meeting recently it was struggling to recruit specialist staff within psychiatry, particularly in the perinatal service, which deals with infant care at a six-bed mother and baby unit at St John’s Hospital, Livingston. A long-serving consultant left the unit at the end of July, and another staff post also became vacant around the same time. Staff have been brought in from the hospital’s psychiatry service, the Royal Edinburgh Hospital and from further afield. Donna Swift, from the Pandas Foundation, which offers pre and postnatal depression advice and support, last night called for support for mothers for as long as it was needed. Victim Support Scotland released this statment on behalf of Chloe’s father, Craig Steedman: “Chloe’s father Craig and his family are upset and saddened that the focus of reports in this case turned to how the system had failed Erin Sutherland and not the death of his precious little girl. Chloe was the victim in this case – a beautiful, innocent child whose tragic, senseless death is impossible to accept.